hey all! HAPPY MONDAY! Are you ready for DAY ONE of the [11 DAYS OF GIVEAWAYS!]? I’m so excited for these next 11 days to share with you some of my favorite products! You may often, I mean often, see me posting about my iHerb.com LOVE. Well, it’s because I DO love this website. I’ve used it for years now. The shipping is SUPER quick & the deals are great! My coupon code at iherb.com is XUG228 for $5 off any order under $40 and $10 off any order over $40 which I share with so many people because it’s a great way to get an extra deal on top of already low prices. The good news? YOU can also create your own coupon too for friends & family to use! On top of that good news – for DAY ONE of this giveaway series, My friends at iHerb.com are offering TWO LUCKY WINNERS a chance to win a $50 SHOPPING SPREE on the website! Coco Cardio Cocoa Beet Powder (makes great hot cocoa or chocolate sauce). Leave a COMMENT BELOW (in the comment section) telling us which product you would most likely get on your Shopping Spree! Repost my Instagram Image onto your Instagram Profile with info about the post! IF you do any of #1 or #2 – please leave an ADDITIONAL comment below saying “I tweeted!” or “I posted about the giveaway” with the link to your post or tweet. You can usually copy the link to your actual post or tweet to share with me for proof. Thank you!! Winners out of the US will be responsible for any additional duties/taxes from their country’s Customs Agency and/or Postal Service. (e.g. iHerb.com pay for shipping, but those additional fees are their responsibility). You can find iHerb.com on Twitter, Instagram, & Facebook – so make sure to connect to stay up to date on awesome specials! **My friends at iHerb.com were super awesome & gave me my own $50 spree to use for my order buy my opinions, as always, are my own!! #PP What's Beautiful? Declare YOUR goal. [Dairy Free] Broccoli & Cheddar Butternut Squash Soup Recipe! I’ve been hearing sooo much about peanut flour, and I’d definitely order some for my shopping spree!! Love iherb!! I need to stock up on larabars and nut butters. I would totally stock up on sunflower seed butter! I’m obsessed just like you! Once I open a jar it’s dangerous. Have already made a list of what to buy next if I win the iherb.com giveaway! Medjool dates, cashews, and raw coconut butter. I love iHerb :-). With a gift card, I would have bought the Green & Black’s 10-pack – my favorite Chocolate. I would get peanut flour and stevia! Puffins cereal, PB2, Chia Seeds and Bob’s Red Mill stuff (to name a few!) I used iherb all the time when living in S. Korea. Best shipping prices! Puffins are the best cereal ever and probably one of the only reasons I can continue to eat gluten free!!!! I can’t wait to try this egg white protein powder! I would order nut butters, since I am obsessed! I am loving me some Maranatha Sunflower butter recently! Also some peanut butter puffins! I would love to try the sunflower seed butter. I’d buy some peanut flour, nutritional yeast, and I’d love to try the CafeCeps! Oh my goodness this would be amazing to win! I totally need to restock after my move and I’m definitely missing all of my flours the most.. coconut, almond, buckwheat.. I need to place a big order! I would definitely buy Coco Cardio! I have been lusting after it for quite some time and would love to make some red velvet treats with it! I tweeted and posted on Instagram! If I won I would buy quest bars for sure! They are one of my absolute favorite things and they make living a healthy lifestyle in college so much easier! PUFFINS! I adore the peanut butter puffins and I’ve always wanted to try nutritional yeast! This is great Kasey! I would buy peanut flour, nut butter, stevia, Coco Cardio! I love iherb!! I am sharing this later today on my IG account @tubbytotoned!! I’d get a ton of almond butter since I got through two jars a week! That cocoa cardio stuff looks awesome and I would love to try it! I’d love to try a new nut butter or protein powder! Thanks for hosting such an awesome giveaway. I would most likely get some of the Artisana or Kevala cashew butter..I had it once and it’s amazing! I would buy some spirulina, Puffins, sweetener and lots of tea!! My goodness what I’d buy! The $50 shopping spree would probably just help me no go broke! lol I seriously love almond flout which I use to make pastries as well as my famous baked fish sticks! I’ve never won one of these and I’d love to be a winner this once because I simply LOVE iHerb! My goodness what I’d buy! The $50 shopping spree would probably just help me not go broke! lol I seriously love almond flour which I use to make pastries as well as my famous baked fish sticks! I’ve never own one of these and I’d love to be a winner this once because I simply LOVE iHerb! I would totally get some Quest Bars they are my favorite . I also tweeted and reposted on Instagram! I would get quest bars! I’m crazy about everything at iHerb so it’s hard to choose! But I’d definitely get some rooibos tea, they have the best price for it! You are always trying such great, incredible new things that I ALWAYS want to try (and some I do as you have seen hehe)… I would love to try some new nutbutters, the crazy beet powder cocoa (as I think you have posted that image before and I was super interested), and I’m almost out of nooch! It’s a travesty! Hope you’re well doll.. and thanks for keeping us all inspired! I would get but butters, quest bars, hemp and chia seeds, and sooo many other lovely things! I’d get protein powder and quest bars! I would get tea, omeal, Quest Bars, stevia…. And many things!!!! I love iHerb. I’ve regularly bought Bluebonnet Protein Powder with Casein from iHerb, and I can’t wait to replenish my stock to help after weightlifting sessions. I’d also love to try Coco Cardio Cocoa for my sweet tooth! I think I would get PB2 and Chia Seeds and Quest Bars. Unfortunately we do not have something like that here in Germany. Well, in the last time you see Chia Seeds coming over to some Health Shops. Being a college student, I would love to stock up on Protein Plus peanut flour, nutritional yeast, quinoa flakes, and whatever else catches my eye! I was already registered, but I would love to try the coco cardio!! I’ve seen it pop up everywhere, so that’s my next purchase. Also, after seeing you rave about Spirulina, I would like to buy that, too!! Any and all nut butters. Registered! I would definitely buy some Yogi tea!! YUM! SOO much I want to buy!. . .. I will def be getting some more Chia Seeds and Vega Protein! Loveeee them! I also tweeted from ItsMeesa75! I’m signed up! I would try some sunflower seed butter because I never have before, and also stock up on some quest bars! I would order my favorite protein powder because they have a great selection of quality whey protein and because i also have a standing order list in my head for iherb.com!!! Sunflower Seed Butter! It really is the best! Thinking practically, I’d probably use the money to buy my Raw One for Women multivitamin by Garden of Life. It works wonders for my health! I’d use any left over money to buy my mom ProBars because she savors them! I would purchase Sambazoms Organic Freeze-Dried Acai Powder since I just ran out! And also more nut butters of course! So excited I can enter this one! I’m already registered with iHerb. I’d get stevia and peanut flour and probably protein powder too. I reposted your Instagram Image onto my IG account ! i would order some protein powder and some probiotics thanks for offering this giveaway! First purchase would absolutely be Coco Cardio Cocoa!!!! I am registered! I love love love iHerb. This would be perfect since I need to restock my pantry at school. I want to get some cool flours to recipe test with! I’d order some vega-one if I won!!! Oh man, probably some cocoa cardio or a replenish on my coconut flour stash! I would stock up on my favorite nut butters and special flours! I’d get my hands on some more Chia Seeds I am also interested in the Stevia flavors! I have been dying to try liquid stevia. I use the powder form and love it, but I’ve seen recipes that call for liquid stevia and I am unable to find it in stores near me. I’ve seen a lot of people purchasing it from iherb so if I got the chance to win I would definitely purchase that and I’ve also been wanting to try sunflower seed butter so I’d try that too. I love walden farm products and would stock up on that and quest bars! Also the Coco Cardio Cocoa Beet Powder looks and sounds interesting so I’d purchase that as well! I tweeted for an extra entry! I registered and I would like to try PB2! It would be great to bring to the hospital and leave in my locker (I am a nurse). Super convenient! without a doubt, peanut flour! my little obsession! love iherb to the moon and back! I was just looking yesterday at purchasing the Thinkthin and Questbars from iherb yesterday! I would buy my multivitamin and fish oil tablets. I compared iherb.com to other sites and they have such a great price on the multivitamin that I take. I also love almond butter so if they have that I would purchase this too. I would love to try the Quest Bars since everyone seems to be raving about them! i love iherb! i wold probably get Neocell liquid collagen and some matcha green tea powder….they are in my cart right now! I want to try some black strap molasses, Neocell collagen & a few more things! Love iherb. I would stock up on peanut flour and tahini. I’d get cocoa cardio, and the coffee drink with cordyceps as well! I love iherb! I would like to get peanut flour! So many people I follow on Instagram seems to love it! I would definitely get some chia seeds and some cocoa cardio! I would love to purchase the peanut flour, stevia, try the cocoa cardio cocoa, and supplements. I love iherb! Their shipping is incredibly fast. I always get sunwarrior vanilla protein powder, peanut flour, and that coco cardio cocoa! I would stock up on Stevia and Justins Vanilla Almond Butter! So this would be my first time using iherb! Reading your blog I have always wanted to use it! I would for sure use it to get Justin’s Almond butter and try Sunflower butter for the first time! Kasey I am very intrigued to try the cococardio! So I’ve been trying to find new ways to find clean food and this is just the site for it! I don’t know where to start, maybe I would try cinnamon Puffins! I am dying to try Justin’s Vanilla Almond Butter. I live in Canada and it’s impossible to find! i am already registered at iHerb! i would like to buy Xanthan Gum, amazing grass superfood chocolate drink powder, and peanut flour! I would most likely get some chia seeds because I ran out and feel so deprived! I want to try the Coco Beet Powder to make hot chocolate! I’ve never heard of this product! Would love to try the cocoa cardio powder! NUT BUTTERS ALL THE WAY!!! peanut flour and nut butter! Woo hoo! Love iherb! I would stock up on my beloved peanut flour and stevia! I would love to get Quest Bars and those Puffins! I’d probably get Quest bars and maybe try the CocoCardio! I would stock up on Quest bars and nooch! i love iHerb! they have such a great selection! my budget i always tight, but they are good with having good prices if it’s something i really really want! i think it would stock up on my liquid stevia flavors as they are pretty pricey in the stores! this would be a great splurge!! i have been meaning to try peanut flour out for the longest time now! I’ve wanted to try the Coco Cardio Cocoa Beet Powder ever since you first mentioned it in one of your posts! 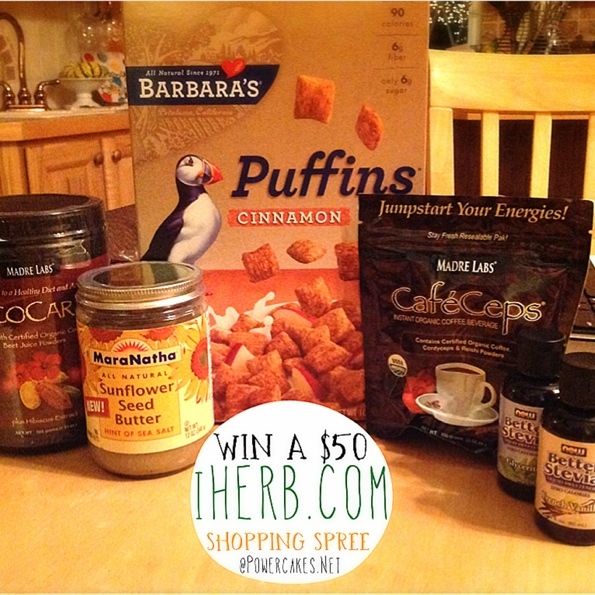 I’ve never used iHerb and would love it if I won the $50! I would definitely want to try sunflower seed butter, have heard such great things. Those cinnamon puffins look fabulous too! I would definitely order peanut flour and I need to stock up on Navitas Naturals Maca Powder and Hemp Seeds. i would love to try some green pea flour for baking (sounds weird, but would be so nice to use with st patricks day not far away!) i’ve looked everywhere for it, and iherb has the best pricing on it! i’d also try some new nut butters, can never have too many of those 😉 thanks for the great giveaways, looking forward to them all!!! There`s a few things I really like to have: Now Foods, Sunflower Lecithin and Cocoa Butter, with Jojoba Oil. I would definetly buy coconut oil! I really want nutritional yeast!! Been seeking it out for ages but no stores near me stock it! I would really love iherb MaraNatha sun flower seed butter YUM! I also LOVE nutritional yeast and Nuttzo!!!! 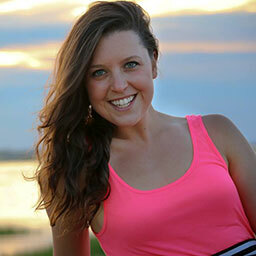 I am currently trying a gluten-free diet and would love to purchase some more gluten-free products! Shopping at iherb i would definitley splurge a little on the quest protein bars! I can’t get enough of these and the chocolate chip cookie dough ones taste so amazing when heated in the microwave for 20 seconds. I don’t miss cookie dough (my weakness) at all with these babies. I’d also have to throw in some liquid stevia, chia seeds and coconut oil for my moring oats! Can we tweet once a day for additional entries, or is it a one time bonus entry? I love this prize! Thanks! Hi Christina! It’s a one time entry on this post to let me know that you tweeted! BUT you can tweet as much as you’d like to let your followers know! ;] Thank you for entering! Hi! 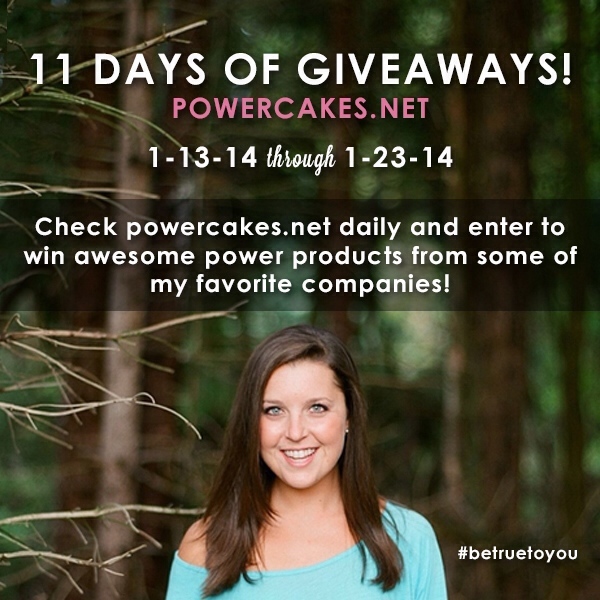 I also posted to my Instagram account ( heathermcclees) with the tags, #powercakes, #iherb and #betruetoyou. Thanks Kasey!!! I would spend it on liquid stevia, peanut flour and pb2! I would spend it on double chocolate quest bars, pb2, and chia seeds! Omg there’s so many things I would buy but definitely the top items would be Quest bars, PB2 coconut oil, and maybe for the first time try some spirulina! Being in dental school keeps me so busy and definitely breaks my bank, so winning this contest would help tremendously in keeping my healthy habits up while heing me save some money! You’re awesome, Kasey! Kasey you’re doing great things! Amazing! I think I’ve found a new obsession with iHerb! I would definitely get the 100% pure manuka honey and spirulina! Nut butters are a must from iherb!! There are so many things I want to get on iherb…pretty much every time you mention all these cool/healthy products, I always want to try them and incorporate them into my diet. To start, I’d love to get some Vega protein powder in chocolate especially. I’m lactose intolerant, so Vega is perfect and it tastes great from the samples I’ve had. There are so many recipes that I’d love to make — some chocolate protein powercakes, anyone?! I’d also love to try sunflower seed butter — I’ve never had it before but seeing as Kasey raves about it, I really really want to try it (and I love PB)! I would stock up on staples like hemp seeds. Ok so I have to admit, I have been meaning to get onto iHerb.com ever since I have been reading this blog and boy I should have started earlier! I have justo spent the last hour looking through the website and have filled my basket past the $50 … But when you live in a remote part of Australia like I do, online shopping is a must, but even then it can be very pricey. The iHerb prices are very reasonable and even when calculated into Aussie Dollars! Sooooo I went shopping firstly I have to say that most of these products I have tried or have been wanting to try are only because I read this blog and the food looks soooo delicious and easy to make…. I’m hooked! Oh and my number one go to snack at the moment…. Well since it was posted is the dip with Noosh, Tahini and Apple Cider vinegar….WOW So as you can guess, Noosh was on my list…. Followed closely by sunflower seed butter and chia peanut spread…. Oh and peanut flour (you can’t get this… Or half of the other products in Australia) I am in love with Clif bars as they are a great snack when I don’t have time… Which isn’t very often because I try to prep a lot but they come in handy and are a treat too! RAW protein cacao flavoured was on the top of my list and I couldn’t resist the choc covered goji snacks… I’m sure that won’t be the last of it, now that I’m hooked on this website hehehehe but it’s a very good start! I would love to get quest bars!! I would for sure get peanut flour, they have my favorite brand of it for a lot less than anywhere else! Coconut butter, sunflower seed butter and milk thistle. I would get more CocoCardio, and go shopping for new finds! I love iHerb!! If I won, I’d most likely get some more coconut butter & almond butter. I would get some Nuttzo and cacao powder! I am registered and would most likely buy more Prince of Peace green tea. I would love to order some of their cocoa cardio! I would buy quest bars. I would like to try flavors I’ve never had. I’m starting my healthy and fit lifestyle by purchasing good food at iHerb now. Please support me to keep working hard to accomplish my fitness and life goal! I would get the Nature’s Plus, Spiru-Tein, Cookies & Cream flavor. Been wanting to try for a while! I have a hard time finding Maranatha Raw Almond Peanut Butter! Or Maranatha anything. I would totally purchase this! ooh I would want stevia and protein powder and green powder thank you! I’d stock up on buckwheat flour, oat flour, almond butter, vegan protein powder and pumpkin (because no stores carry it now!). I would definitely buy the Really Raw Honey, Never Barreled, Heated or Strained! Yum! Yum! Registered as well! I love me some sunflower seed butter and stevia so I would probably stock up on those! I love iHerb! I’d love to stock up on Sunwarrior protein! The Coco Cardio looks really good! I also need to restock on my hemp hearts and cacao nibs. I just love browsing their site and looking for good stuff to try!!! I’d get quest bars and protein powder! I would get cacao powder and nibs, goji berries and bulk coconut oil. Definitely peanut butter puffins! Also been dying to try Justin’s vanilla almond butter, coconut flour, and peanut butter cookie larabars. Chia seeds, spirulina, coconut oil…. I love iherb…definitely get some, nut butters, chia seeds, gluten free flours, probiotics! Coconut Oil and Coconut Flour!!! I also tweeted the comment, hope luck is on my side! I would love to get some 5-THP to try out! Signed up for an account. Thanks ! I love iHerb! I would definitely have to splurge on coconut butter, goji powder, acai powder, and peanut flour. I’d spend way more than $50, but the win would most definitely help! Thank you for hosting this giveaway! I would get some Vega protien powder and I think it would be a good chance to try some things I’ve been looking at but haven’t tried. I registered and I’d love to get the Real Techniques brushes! There’s so much I would love to buy off iHerb with this prize! It’s such a great site for any hard to find ingredients! I’d struggle to only spend $50 — too much I want!! I might get some nut or seed butters. I’d stock up on nut butters and puffin cereal!!! It’s really difficult to pick just one item! My top choice would be liquid aminos because I’ve heard you talk about them so much! But I’d also order the toffee liquid stevia you mentioned in a couple posts, the Avalon Organics lavender-scent products and facial serum and I’ve been wanting to try the Vega-One shakes!! I’m already registered – there are a lot of things i would buy. Starting with coconut flour. I would love the aromatherapy oils, chia seeds, better stevia, and the cacao powder! I would love to try Spirulina! Also I’d stock up on liquid stevia and peanut flour. I love your site!! I’m sharing your image on IG! Stock up on some SweetDrops for my coffee! AHHHH I WOULD LOVE TO TRY THE Cafe Ceps Organic Freeze Dried Coffee Powder!!! QUEST BARS!!!! TONS AND TONS OF QUEST BARS!! I am registered, and I would try Justins almond butter! I tweeted about the iHerb.com giveaway! You are a winner, amanda!! Please e-mail me Kasey@Powercakes.net – thank you!! I am dying to try some of the Vega products that you speak so fondly of!!!!! Thank you so much for the opportunity to win this giveaway! I would get some Benecos and Physicians’ Formula make-up products, as they’re not directly available here in Italy! Thank you and good luck to everybody! I would buy some cocoa butter( maybe Cococare, The Yellow One, Cocoa Butter Cream, 15 oz (425 g) ). I would definitely grab some Nutritional yeast & a few other super foods! I would spent some of the money on Quest Bars! I would select Better Stevia Liquid Stevia – I LOVE French Vanilla, and am looking to try additional flavors! I would definitely want to try Better Stevia Liquid Stevia – we don’t have it available in stores here in Canada. Also dying to trying PB2, and would certainly want to order some VEGA protein too!